With my one-man show “The Garden and Beyond” looming, I knew I needed more work to fill the walls. Having quite a lot of ‘beyond’ but not so much ‘garden’ I felt the need to do more work of a Garden theme. I’d bookmarked this image in my brain from a series of photographs which I had taken In my wife’s parent’s garden in New Zealand. I loved the compositional shape of all the planting in the centre of the picture. With lovely whether, lighting the image clearly it was difficult to find anything to add to the piece. Feeling the need to put my mark on it (or why not just print up the photograph) I added a UK cat to the shadows. Frankly this adds little but make me feel that I’ve ‘worked’ on the piece. 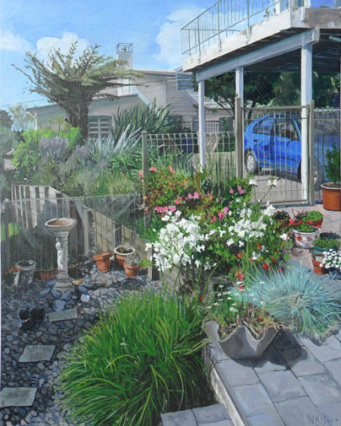 Originally I formatted this piece as my other garden pictures with image proceeding around the edge of the deep-edged canvas (A lot of work I might add). On completion, however, I felt this detailed image needed containing, and so I treated it to quite a chunky frame.